With 1.13 billion daily active users (as of September 2016), Facebook is the third-busiest site on the internet, according to Alexa, and has built an extensive infrastructure to support this already massive and still growing user base. The social network was launched in February 2004, initially out of Facebook founder Mark Zuckerberg’s dorm room at Harvard University using a single server. The company’s servers are now housed in numerous gigantic data centers around the world. Facebook has not stopped building new data centers and seeking for new data center sites ever since it launched its first company-built and operated server farm in Prineville, Oregon, in April 2011. Each data center houses tens of thousands of computer servers, which are networked together and linked to the outside world through fiber optic cables. Every time you share information on Facebook, the servers in these data centers receive the information and distribute it to your network of friends. We’ve written a lot about Facebook’s infrastructure, and have compiled this information into a series of Frequently Asked Questions. Here’s the Facebook Data Center FAQ (or “Everything You Ever Wanted to Know About Facebook’s Data Centers”). How Big is Facebook’s Internet Infrastructure? Facebook requires massive storage infrastructure to house its enormous stockpile of photos, which grows steadily as users add hundreds of millions of new photos every day, and as it expands its platform capabilities to support video and, more recently, 360-degree video. In addition, the company’s infrastructure must support platform services for more than 1 million web sites and hundreds of thousands of applications using the Facebook Connect platform. To support that huge activity, Facebook has built four huge data centers with two more sites under construction as of September 2016, and leases additional server space from data center providers in several locations in and outside of the US. The company’s massive armada of servers and storage must work together seamlessly to deliver each Facebook page. “Loading a user’s home page typically requires accessing hundreds of servers, processing tens of thousands of individual pieces of data, and delivering the information selected in less than one second,” the company said. Before it started building its own server farms, Facebook managed its infrastructure by leasing “wholesale” data center space from third-party landlords. Wholesale providers build the data center, including the raised-floor technical space and the power and cooling infrastructure, and then lease the completed facility. In the wholesale model, users can occupy their data center space in about five months, rather than the 12 months needed to build a major data center. This allowed Facebook to scale rapidly to keep pace with growth of its audience. But the company has since developed powerful internal data center engineering capabilities, which it has successfully employed to build one of the world’s most massive-scale data center portfolios. Where are Facebook’s Data Centers Located? The first building at Facebook’s data center campus in Oregon, built on a high plain above the small town of Prineville (Population: 10,000). In January 2010 Facebook announced plans to build its own data centers, beginning with a facility in Prineville, Oregon. This typically requires a larger up-front investment in construction and equipment, but allows greater customization of power and cooling infrastructure. The social network has since expanded capacity in Prineville and built data centers in Forest City, North Carolina, Lulea, Sweden, and Altoona, Iowa. It has been expanding capacity in each of those locations continuously by building additional data center facilities. The company is also building data centers in Fort Worth, Texas, Clonee, Ireland, and Los Lunas, New Mexico. Facebook has publicly admitted to leasing data center space only in Ashburn, Virginia, but sources have told Data Center Knowledge that it also leases capacity in Singapore. How Big Are Facebook’s Server Farms? 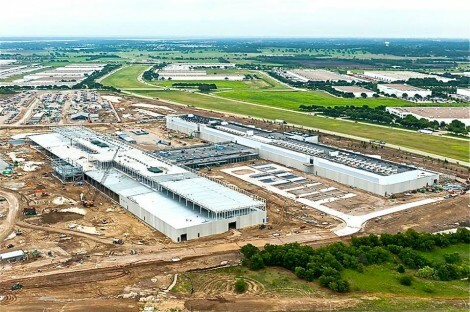 As Facebook grows, its data center requirements are growing along with it. The data center Oregon was announced as being 147,000 square feet. But as construction got rolling, the company announced plans to add a second phase to the project, which added another 160,000 square feet, bringing the total size of the campus to 307,000 square feet – larger than two Wal-Mart stores. Last year, Facebook secured permits to build another 487,000-square foot data center in Prineville. NEXT: How Many Servers Does Facebook Have?